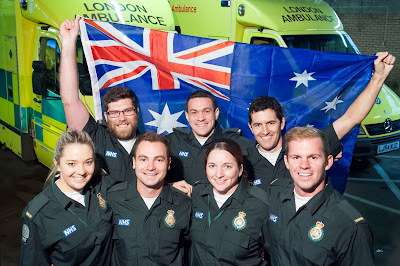 A growing number of Australian born paramedics are relocating to the United Kingdom on Tier 2 visas. Reports indicate that the relocation is because of better pay, more interesting work and improved working conditions. In the last 12 months, Britain has held three recruitment campaigns in Australia aimed at recruiting experienced paramedics and recent graduates. With the promise of free airfares, generous relocation packages, better training and an improved work-life balance, 450 Australians have, so far, taken up roles in the UK with a further 40 to follow in July 2016. Australia’s Governor-General, Peter Cosgrove, visited the London Ambulance Service’s emergency control room in central London last week, attending to ‘recognise the significant contribution‘ that Australian trained paramedics were making in Britain’s capital city. Mr. Cosgrove was also taken on a tour of the site where a dozen or so paramedics had recently made the move from Australia to the UK on a Tier 2 visa, expressing significant support for their efforts. Acting President of the Australian Paramedics Association, Amir Samuel, revealed that staff in Australia were ‘overstretched‘, and there is not much demand for recent graduates down under. He went on to say that young, fresh out of university graduates were heading overseas because they were unable to secure employment with a state-based ambulance service in Australia. The relocation of hundreds of Australian paramedics is just one example of why freedom of movement would benefit both the United Kingdom and Australia. Where new graduates are unable to attain employment in Australia, opportunities exist for them in the UK allowing them to gain valuable experience in their line of work, while simultaneously benefiting the UK economy and health service. The “paramedic shift” is likely to continue under the UK’s Tier 2 visa scheme, encouraging young Australians to move to, and work in, the United Kingdom, with potential for a permanent relocation on the horizon pending the success of the current free movement campaign underway.